Inventory We are a resale marketplace, not a box office or venue. Ticket prices may exceed face value. This site is not owned by Schottenstein Center . The Schottenstein Center is located on the campus of Ohio State University, in Columbus Ohio. The full name is Value City Arena at the Jerome Schottenstein Center. The Schottenstein Center box office plays host to every Ohio State Buckeyes basketball and men's ice hockey games. 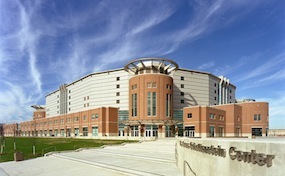 The Schottenstein Center Columbus opened November 3, 1998 at a construction cost of $116 million. The venue is a multi-purpose sports and concerts complex. Schottenstein Center tickets have included such big names as The Rolling Stones, Cher, Van Halen, Neil Diamond, Taylor Swift, Paul McCartney, Metallica, Bob Dylan, Aerosmith, and Roger Waters. Schottenstein.CenterColumbus.com is not affiliated with any primary box office or vendor. We are the premier provider online for all secondary market shows and events. To purchase tickets to any Schottenstein Center event simply just click on the show of interest or call our operators at anytime.